Bang Tao Beach is an unusual mix of traditional Thai village with modern and massive high end resorts. The large open bay is one of Phuket's longest and celebrated beaches. While, like most of Phuket, the area was once used for tin mining, Bang Tao Beach has now been firmly taken over by the tourism leaning of the island, and is dominated by luxurious resorts and villas gracing the 6km stretch of beach front. However, a few minutes away, the town of Cherng Talay continues to function in old Thai trades, fishing, farming and rubber tapping. Thailand is the world's leading exporter of rubber, so it's worth taking a look at this vital area of occupation. The luxury Laguna complex occupies the largest part of Bang Tao Beach, a five star hotel development with an international golf course. Further accommodation is available outside Laguna at the bay's southern end and includes resorts and villas. The northern end of the beach is still fairly undeveloped and so unpopular and not crowded with tourists. You'll find a few bars and seafood restaurants along the beach, mostly frequented by residents. There are also plenty of up market places to eat near the Laguna with The Supper Club and Toto being the most popular, while Back Cat offers excellent value for money in a chilled out atmosphere. There's a distinct community feel for expats with venues such as BB's Pub which has live music and live sports. 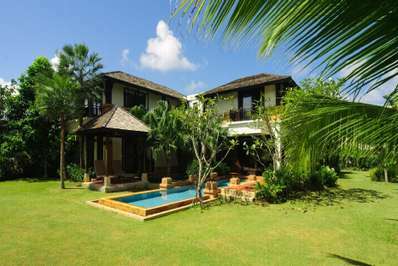 The villas of Bang Tao beach are usually high end and often fully serviced. 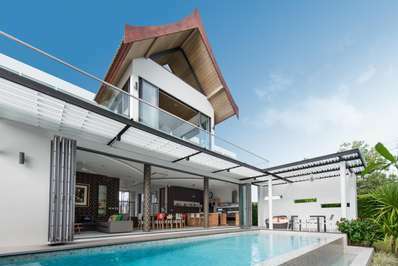 These villas compete with the nearby Laguna resort and its multitudinous facilities and amenities, so require a certain level of quality to suit the area. 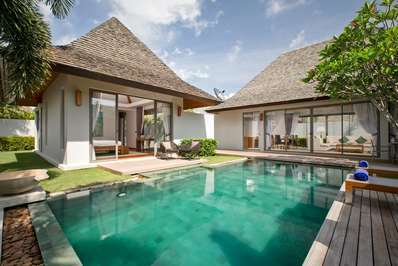 In contrast to Laguna, the villas represent a personal and private space, sought after by those looking for an independent and luxurious holiday, away from the regimentation of life in a resort hotel, but with all the comforts. Phuket is connected to the main land by two well used suspension bridges, and is reached by bus from across Thailand. Major pick up points are Hat Yai, Suratthani and Bangkok. The nearest train station into the island is Suratthani. Phuket International Airport is served by a number of competing airlines, mostly dominated by Bangkok Airways. Once there, you can hop in a shuttle bus or metered taxi to Bang Tao Beach. Rental cars and motorbikes are an option once you're settled, but the roads are hazardous. There's also a bus service around the island, and ferries to nearby tourist attractions such as Koh Pi Pi and "James Bond island."